Dreams are funny. Happy or sad, scary or exciting, they all end when you wake up. Whether you’re relieved it’s over or so disappointed that you promptly make every attempt to fall asleep and jump back in, ultimately the only reality of a dream is starting a new day when it’s over. Mine is the rare privilege of living my dream long after waking up, and it started with a simple phone call in late September when a faceless voice requested an interview about our charity, Sleep in Heavenly Peace. The following may contain spoilers. 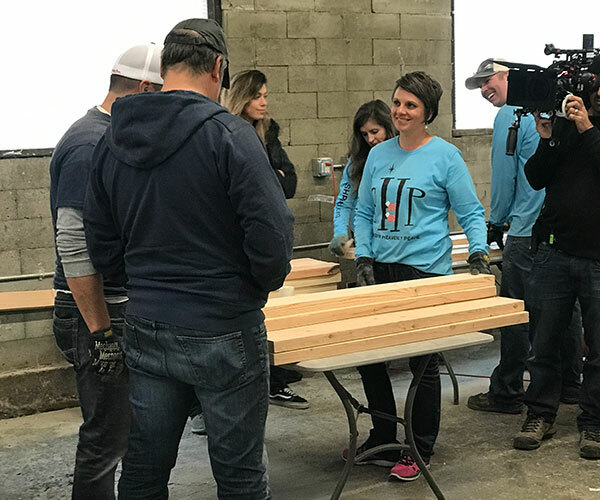 If you haven't watched our feature episode of Mike Rowe's Returning the Favor on Facebook, we invite you to click on the link below and check it out now. Otherwise, read on! I quickly realized this wasn’t a normal interview like many I’ve done before as the young lady on the other end asked if we could conduct this interview through FaceTime. Although the questions were familiar, my gut sensed something unusual. I was perplexed why someone from New York would be so interested in a small charity from Kimberly, Idaho. And she wanted to know everything about us, so I shared my passion about our mission and even shed a tear talking about the great need our charity is trying to solve, even encouraging her to start a chapter in New York. Remember, this is a complete stranger. After we finished, I finally asked, “who are you with and what is this for?” With hesitation and a quick, distant glance, Tyler convincingly explained that this is for a web/magazine series they’re doing and left it at that. Despite feeling excited about the prospect that our message would reach people on the east coast and dreaming about helping kiddos across the country, I awoke from my daydream and went headlong into real life. Weeks later, returning home from a successful hunting trip, I received another phone call, quickly recognizing the familiar voice. It was Tyler from New York. She politely asked me how life was going and how SHP was doing. Tyler was fast learning what all my family and friends already know, that SHP is my favorite thing to talk about, and I relayed all the wonderful events we had planned. She then asked me the one question that triggered my every daydream, “Can we fly out to video you for a couple of days in November?” Only three words registered: “We...fly…and video?” Multiple questions flooded my already dizzy head. “We?” As in there is more than one person involved? “Fly”… so wait, you are going to the expense of flying those multiple persons from New York to Idaho? And finally, “video” for a magazine? I guess New Yorkers don’t use paper in the magazines anymore. I gathered my wits and accommodated Tyler’s request and the schedule was penciled in... November 14th - 16th. When November 14th arrived, I was anxious and nervous, worried whether I would represent our charity and all the good people involved as they deserved. We planned to meet the film crew at our warehouse in Kimberly to conduct the interview and when I arrived, there were cameras and lights and people spread out all over the place. The two people I expected to be there were nowhere to be found, and instead I met a slew of cameramen, producers and staff. I was in shock at what laid before me. I felt like I was in some movie with secret service people running around with microphones in their ears checking on this and that. 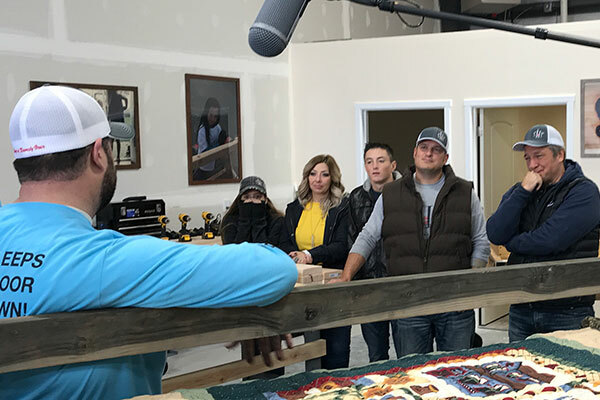 Despite the frigid temps in our warehouse, we completed a 3-hour interview where I told the entire crew about the joy and excitement SHP has given me and my family for the past 5 years. It was surreal, to say the least. I didn’t know what to do other than give him a huge hug, as my head started to piece this whole thing together in a matter of moments. 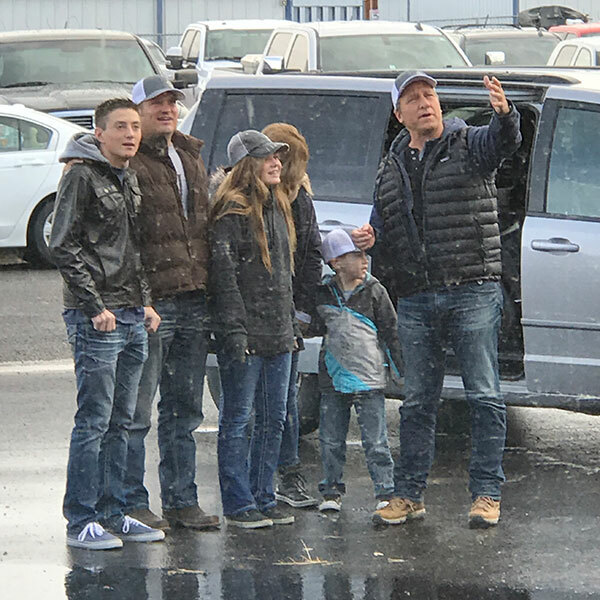 I shouted, excited for everyone to meet him, “Look everyone, it’s Mike Rowe.” Of course, everyone had already known for weeks. If it was surreal the day before, today just became epic. We spent an hour walking around the warehouse, meeting everyone, showing Mike just what it is we do and how we do it. He got a chance to ask our new Chapter Presidents some questions about what SHP means to them and why they became involved. We even put gloves on him and had him brand one of our headboards. I couldn’t help but fight the tears away, seeing someone as famous and influential as Mike Rowe take time and interest in our SHP Family. 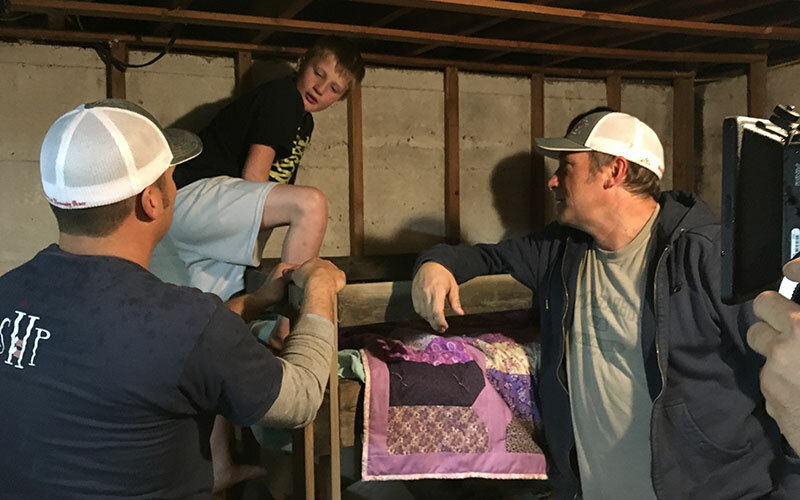 Later that day, my wife, Heidi, my lifelong friend, Jordan Allen, and myself were honored to take Mike Rowe on a bed delivery. It was a cold and rainy evening as I drove Mike to a home where three special kiddos where waiting for their beds. In a dark basement with not much more than a mattress on the bare concrete floor, we all assembled the beds. It was another in a long string of surreal moments. After we finished, I asked Mike what he thought about the delivery and he was in shock that there were kids living in conditions like that with no beds. I had forgotten just what an impact it leaves on people that don’t normally see this kind of thing. I mentioned that at the very least, they had mattresses already. Many kids we deliver to don’t even have that. With a tear developing in his eye, we shook hands and he thanked me for giving him this experience and encouraged me to continue to serve as we do. I reassured him we would, and we parted ways with another hug. Jordan, Heidi, and I took a moment in the trailer to collect our emotions as we reflected on what just happened. I don’t think words can even describe exactly what we all felt that night. As Mike and the crew drove away, we closed the trailer, jumped into the SHP truck, and headed to the last delivery for the day. Exhausted and emotionally drained, we didn’t speak a whole lot. We did however feel the familiar impressions of love and joy from helping more kiddos get off the floor and into their own beds. Later that night at a special dinner with all the Chapter Presidents, we had an unforgettable experience sharing all the gifts we have received from our SHP adventures. During that dinner, I received a strange text from Sarah, the show’s producer, asking me if they can get a few more shots of us in our warehouse the following morning. I of course agreed and we went home, eager and happy knowing we would see our New York friends once more. We hopped into our vehicles and headed to some unknown location. After all that had happened and the emotional days we had experienced beforehand, my brain was utterly fried. The entourage of cars whined around town, going back and forth through familiar streets and buildings, each one leaving me guess as to which building held our lost tools. Suddenly we turned down a very unfamiliar road and approached a crowd of very familiar faces. There were more people there than I could count. Friends and family, volunteers and bed recipients. All of them clapping and shouting as we pulled in front of the building, surrounded by fire trucks and a large American flag hanging in front of the building. As I got out of the car, I noticed all the faces, yet there were no SHP Family members to be seen. Mike grabbed my shoulder and began to tell me the real reason why he was there and how they, and I mean everyone, had been lying to us for some time. They were not there to shoot a web/magazine series, but that this was a Facebook series called “Returning the Favor.” I was beyond stunned, even speechless. He explained that we had been nominated by a number of people who thought SHP was deserving of such recognition. He also explained that the community and the show had teamed up to return the favor that we had been doing for the community for so many years. 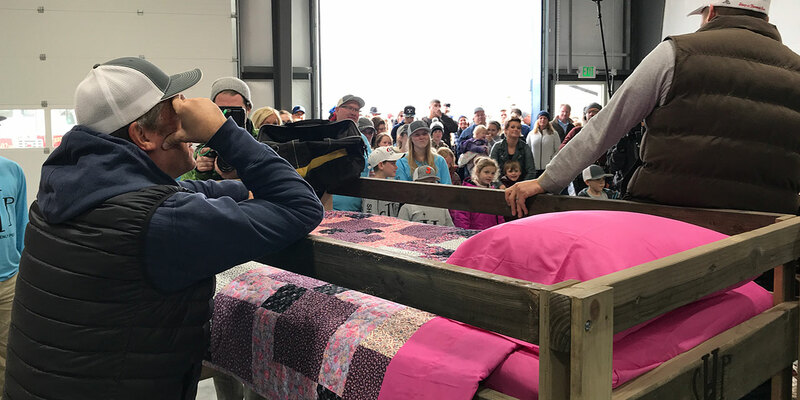 With my family in my arms, they presented us one of our headboards that revealed a donation of $120,000 worth of services, all devoted to the construction and rent of our new Sleep in Heavenly Peace warehouse, so appropriately named SHQ. I could no longer hold back the tears as I watched the large doors roll upwards to expose our entire SHP Family hiding away inside, with a piece of lumber, waiting for my christening cut. With tears in my eyes and what felt like the whole universe watching, I cut the board and entered our new headquarters. My dream was now a reality. As most dreams end when you wake up, mine started and ended while I was wide awake. SHP now has a location we can call our own. We can store tools and materials, build bunk beds, train new chapter presidents, and present a professional face to the community at any time. SHQ is a place where we can organize and plan for the future. A place we can call home. Dreams are funny and most of them end the moment you wake up. But if you dare to dream as my experience shows, some never die and you get to live them every day.